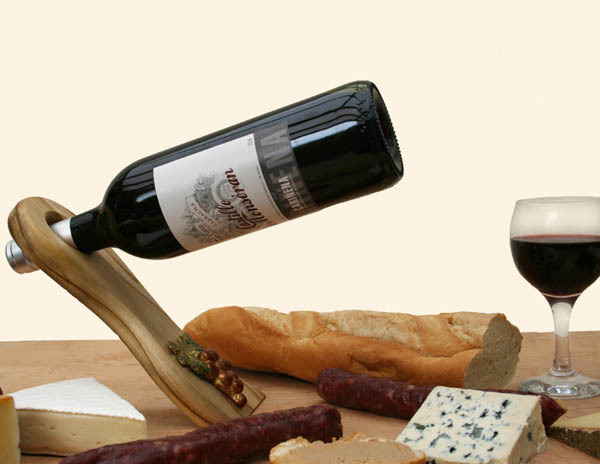 The bottle holder is a special and elegant way to display a wine bottle. Use it as a centrepiece : it will surprise your guests! "There must be a trick... it must be glued or screwed to the table!" Not so! There is nothing magic about the bottle holder. It keeps a balance with the bottle counterweight. Try it... you'll like it! Furthermore, once your bottle is opened, you can use the other side of the bottle holder to hold it in a funny and intriguing way. It will surprise your guests!